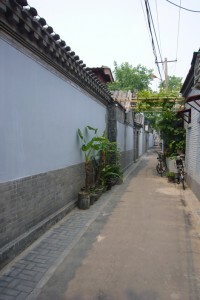 In this city, hundreds of miles of flowered roses for the Olympics, where the major monuments have been “refreshed” or renovated, about half of the urban heritage of the hutongs, the narrow streets of the historic capital, has disappeared. They have been replaced by large buildings, shopping centers; a part of what remains is either being destroyed or renovated / reconstructed into luxury residences. It is true that the houses, despite their charm, have been damaged by dense occupation and often do not have running water or toilets. Visit the homes of famous writers and artists of Chinese history is not complicated: you need a guide with Mandarin characters of the place to visit AND its address. This is not included in most of the guides published. I used “Beijing pocket” (Ed Yu-Feng, Paris, 2008) published by Stephanie Ollivier [which is found on Rue89 during the Olympics]. 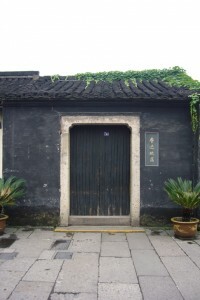 The house of the founder of modern Chinese literature is adjacent to a modern museum formal and unattractive, sometimes invaded by school children. This museum, like other sites, includes few explanations in English, but the young visitors will be pleased to translate and you will pretend to understand their English which is very limited. All taxis know this place, as Lu Xun, creator of heroes that everyone knows (the famous Ah Q ), is for the Chinese the equivalent of Victor Hugo for the French. Lu Xun was born in Shaoxing, southeast of Shanghai, in a beautiful house of the Zhou clan (his real name was Zhou Shuren) with interior gardens and beautiful furnishings which recreate the atmosphere of the early twentieth century. He died in 1936, and was taken over by the Maoist power. His talent as a polemist is spectacular. You can find his books in the Foreign Languages Bookshop in Beijing at the beginning of the pedestrian Wangfujin Avenue, near the home of Lao She. 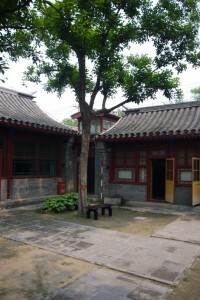 A nice house in an interesting hutong . Ask at the entrance for the brochure in French nicely printed on the great writer Lao She . Take also in your luggage a few paperbacks (“The rickshaw”, “People of Beijing”, and especially an unfinished and autobiographical novel “The New Year Child”). A nice place with an atmosphere of serenity. Of Manchu origin, he is a great novelist, Beijinger and proud of it, but who has lived abroad (in England and the USA) and traveled extensively. His open mind has led him to being beaten by Red Guards during the Cultural Revolution, and found “suicided” in 1966 in the Taiping Lake. Easy to find, north of Beihai Lake, at the junction with Lake Hou Hai. A beautiful house with a very pleasant garden but with furniture with no charm, a bit like the owner. After studying in Japan, Guo Moruo joined the CPC in 1927, and had to escape to Japan. President of the Academy of Sciences from 1949 to 1978, he knows how to sail with the wind and survives the Cultural Revolution. His poems and plays are not reprinted but if you find “My childhood years” (1970) Gallimard; it is worth reading. Mei Lanfang was born into a family of actors and soon became known for his performance of female roles. This “star” was the promoter in Japan and the United States of the Beijing Opera; one discovers his photos with Charlie Chaplin or Mary Pickford. A beautiful house with a very nice garden, but also a few groups of Chinese visitors with guides, banners and loud speaker! There it is much more quiet and you’ll probably be alone in this beautiful garden. Journalist, novelist, Mao Dun was Minister of Culture from 1949 to 1965 and president of the Writers’ Association from 1949 to 1981. Before this period, he was a good writer and his novel “Midnight” is a strong portrait of Shanghai’s triumphant capitalism of the pre-war. He gave his name to the most important Chinese literary prize. You will not find it in guidebooks: It is located southeast of the Olympic facilities, ( Wenxue guan Lu, tel: 84619071 or 84615522).This museum for the fans of literature displays a large documentation on the writers of the twentieth century and recreates the workrooms of several great writers. Virtually no texts in English, but you can find young guides who speak good English but know only little on literature! A tiny section is devoted to very interesting literature of Taiwan, and our tricky questions got embarrassed answers! 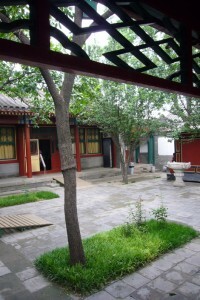 The very idea of a “Museum of Literature” is something almost unique in the world and shows the political importance attached by China to literature.